On Tuesday night, Kid Cudi shared a note to fans on Facebook, announcing that he had checked himself into a rehab program for depression and suicidal urges. "I haven't been since you've known me," Cudi wrote. "If I didn't come here, I wouldve done something to myself. I simply am a damaged human swimming in a pool of emotions everyday of my life." Today, longtime fan and collaborator Travis Scott offered words of support to Cudi. "We love u bro," Scott wrote on Twitter. "U mean everything to us. Ur life is to important to us in ways u don't understand. DONT FORGET." 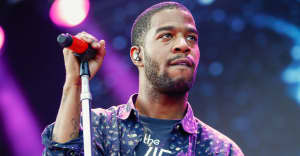 Kid Cudi is featured twice on Travis Scott's Birds In The Trap Sing McKnight album and has frequently discussed his admiration for the Cudi. Read a brief summary of Travis Scott and Kid Cudi's friendship from The FADER.